This year marks the centennial of women’s suffrage in New York State. To celebrate the Historical Society has planned a variety of activities including the exhibit “Good Results Have Followed: Women’s Rights Movement in Geneva, 1848-1917” (now on display), a reading and discussion program with the Geneva Public Library, a suffrage themed spring lecture series, an anti-suffrage tour of Rose Hill in the summer, and (perhaps my favorite) a bus trip to Albany in December to see Votes For Women: Celebrating New York’s Suffrage Centennial at the New York State Museum. In preparation for our activities and to help the Ontario County Historical Society with a county-wide project, I’ve been immersed by in Geneva’s suffrage history. Over the course of the year I will be sharing what I’ve found through a series of blog posts. First, is a basic time line of events from 1848-1918. July 19-20, 1848 – Rhoda Palmer (1816-1919) attended the first women’s rights convention in Seneca Falls. Though she never officially joined the Quakers Rhoda regularly attended the Junius Monthly Meeting. It’s through her Quaker ties that she learned about the convention. 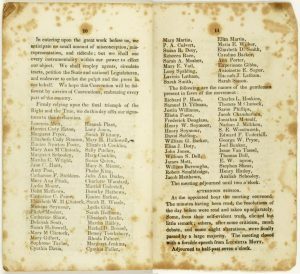 Rhoda and her father were among the over 300 people who attended the convention and she was one of the signers of the Declaration of Sentiments. 1871 – Under the village charter female property owners in Geneva were granted the right to vote on tax issues. 1880 – Women in New York State granted the right to elect school board members and be school board candidates. 1894 – Anne Fitzhugh Miller (the youngest child and only daughter of Elizabeth Smith Miller) became active in the suffrage movement after she gave a speech at the New York State Constitutional Convention. November 3-6, 1897 – Through the efforts of Elizabeth and Anne Miller the New York State Woman Suffrage Association (NYSWSA) held their annual convention in Geneva. Convened at both the Collins Music Hall and Smith Opera House, featured speakers included Susan B. Anthony and Dr. Anna Howard Shaw. 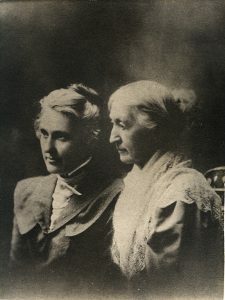 November 30, 1897 – Influenced by the convention Elizabeth, Anne, and other community members formed the Geneva Political Equality Club (GPEC). Open to men and women, the GPEC became a forum to discuss current issues and educate people about issues concerning women’s rights. Anne served as the club’s president from 1898 to 1911 with Elizabeth as honorary president. The Millers also used their connections to bring well-known speakers like Carrie Chapman Catt and Emmeline Pankhurst to Geneva. At least four other clubs in Ontario County (Phelps, Clifton Springs, Gorham, and William Smith College) were formed through the GPEC. With the Phelps PEC, the GPEC also formed the Ontario County Political Equality Club in 1902. By 1907 the GPEC was the largest club in the state. January 1905 – Former teacher and school administrator Harriet Pope had two firsts in Geneva history. She was the first woman to serve on the school board and the first woman to hold public office. In December 1904 during the annual school meeting Harriet got the most votes but did not receive the majority as required by the state. When a school board member resigned in January 1905 Harriet was appointed by the school board to a one year term. She was elected to a full term in December 1905 and was re-elected in 1909. September 1914 – The Geneva Anti-Suffrage Society formed. Limited information has been found about the club but it appears that the club primary brought speakers to Geneva. Agnes Swan Hutchins (1864-1951) served as president from 1914 to 1917. November 1917 – New York became the first eastern state to grant full voting rights to women. November 1918 – At the age of 102 Rhoda voted for the first time. She was the only signer of the Declaration of Sentiments to do so. January 1918 – Though the GPEC disbanded, club members organized a meeting that led to the formation of the Geneva Women’s Club.